Story of the Day | United We Blog! A small aircraft taking tourists on a sightseeing trip around Mount Everest crashed in Nepal on Sunday, killing all 19 people on board, officials said. The Buddha Air Beechcraft plane carrying 10 Indian passengers, three other foreign tourists, three locals and three Nepali crew crashed into a hillside in heavy rain and fog at Godavari, around 10 kilometres (six miles) from Kathmandu. “All 19 people have died. 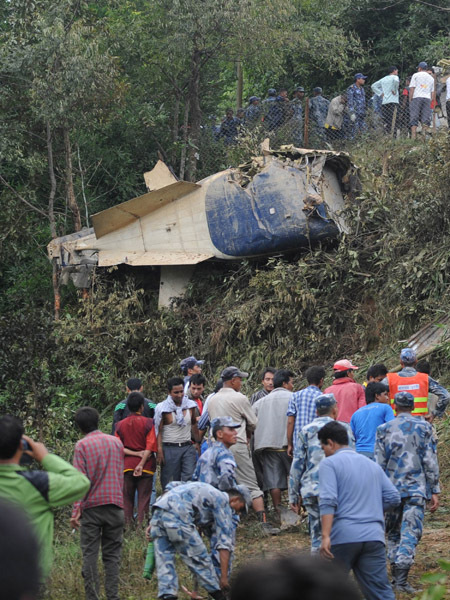 The Buddha Air-103 was returning from a mountain flight when it crashed into Kotdada Hill,” said Bimlesh Lal Karna, head of the rescue department at Tribhuwan International Airport. The Presidential Shock to UML: Ultimately Madhes Leads!?! Or is it the Maoists who will actually lead? Today, Kathmandu is closed down again. No vehicles are running, no shops are open and no business is operating. People are scurrying hurriedly on their feet to their destinations for fear of mis-happenings. The smoke of the burning tires in crossroads has choked the neighborhood. In many places, not only public and private vehicles, but also ambulances have been stopped. On May 25, 2007, Educational Republic Forum (ERF) that is close to Communist Party of Nepal (Maoist) and Institutional School Teacher’s Union (ISTU) organized a sit-in at the Ministry of Education and Sports (MoES) on the eight day of the strike of all public and private educational institutions at and below Secondary level. Police charged with baton and fired tear gas, where more than 76 people were injured. Many have severe wounds in the head and many others have fractured hands and legs. Protesting the brutal treatment to them, they called for transport strike within Kathmandu from the afternoon. This has further aggravated the environment for talks. On May 26, 2007, ERF and All Nepal National Independent Students’ Union (Revolutionary), Maoist Student’s Wing, demanded for a public apology from the Education Minister Pradip Nepal for his order to inhuman and cruel treatment and abuse to the demonstrators, and compensate expenses for medical treatment to the injured. Almost 7.8 million students across the country have been affected by the strike. Both the organizations had jointly organized rallies, processions and meetings throughout the country, and called for an indefinite strike. Their original principal demands were: all the agreements done by earlier governments should be immediately implemented; and the private schoolteachers and staffs should be availed remuneration and facilities equal to the civil service. •	Educational sector has been a wrestling ground of political parties. •	Significant differences exist in private and public schools in terms of policies, strategies, curriculum, etc. •	The private schools charge high admission fees annually and monthly fees compared to public in the name of better education. Similarly, there are discrepancies concerning fees in different private schools. •	The salaries and benefits to teaching and non-teaching staffs of private is less compared to public; whereas there is discrepancies amongst private schools in these regard too. •	Textbooks are not available in the remote areas on time. •	Many public school teachers have not been availed permanency albeit their long services (some even more than 20 years) so that their occupation is not secure. •	Civil Servants and officials along with public school teachers send their children to private schools. The leaders of political parties and senior bureaucrats send their children to schools abroad. Whereas, they are the prime investors and investing heavily on the private schools. •	Education although a foundation to economic, physical, social and cultural phenomena, has been less prioritized in the government policies, plans and programs. The agendas included in the programs are not implemented on time. •	The MoES in drowned in corruption and commission. •	The Asian Development Bank and World Bank have been imposing educational reforms that are not compatible in Nepali perspectives. •	No educational materials developed by the government on mother tongue for the ethnicities and nationalities despite of government’s repeated commitments. •	Illiterate parents/guardians also have ‘inkling’ towards English and send their children to private schools. •	Discrimination: The children of the rich families study in rich private and better schools and become doctors and engineers, whereas those from the poor families are bound to study in poor public schools to become their workers. •	Parents impose their wishes on the children while selecting the subjects or schools. •	There is no forum to share and discuss the issues relating to education among students, teachers and parents. •	The Nepali media has not given due response to this critical issue, but exclusive coverage on politics. At a time when certain embassies are casting doubts on the fate of CA elections, India has supported Nepali Prime Minister’s position that election must be held at any cost. This is important because elections must be held on time. To differ the election date means to give time to play dirty games to the royalists against democracy. Indian Ambassador Shiv Shanker Mukherjee today said that Nepal could “set its own example” on the issue of holding timely elections to the Constituent Assembly (CA). The Indian Ambassador’s statement comes amidst comments from some diplomatic corps in the capital that holding of the CA elections by stipulated time was not possible, and that the election would lose its credibility in front of the world community, if held forcefully. Talking to reporters after a meeting with Prime Minister Girija Prasad Koirala this morning, Mukherjee said, “Finalising election policies to meet international standards is not a priority issue” adding that Nepal could set its own examples in this regards as it had done during the peace process. Mukherjee further clarified that the Indian government would “support and assist” whatever election date the eight parties decide on. The Indian envoy had called on PM Koirala to discuss border security issues. According to sources, during the 20-minute long discussion held this morning at the PM’s Baluwatar residence, the duo deliberated ways to strengthen security vigilance at the Indo-Nepal borders. The Indian Foreign Minister Pranab Mukharjee, during the recently concluded 14th SAARC Summit in New Delhi, had expressed commitment towards making stronger security arrangements to prevent criminal activities in the Terai region, where evidences have pointed towards involvement of Indian criminal elements in the recent string of unruly activities there. Indian Embassy spokesperson Gopal Bagle informed that the meeting had discussed the latest political developments in Nepal and the challenges that lay ahead. >>Before this, the US Embassy in Kathmandu showed it’s concern over Prachanda’s remarks in Pokhara the other day.